“The Tamil people voted for you on the basis of the principles of Tamil nationalism. You should understand their feelings and work to realise their aspirations. Love for one’s country comes from one’s love for home, family, village and region. In this sense I encouraged love for one’s region, as it is necessary to strengthen a liberation struggle. 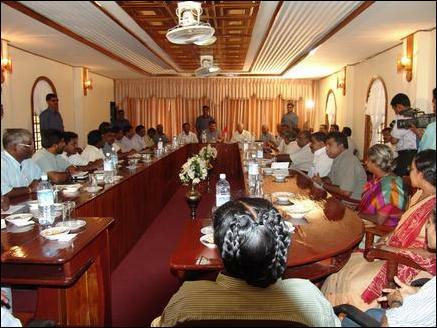 But it is dangerous when the affection for one's region is exploited for selfish motives”, said Mr. Velupillai Pirapaharan, speaking to 22 MPs of the Tamil National Alliance at the LTTE’s political division headquarters in Kilinochchi Tuesday. 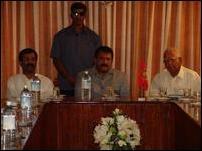 Mr. Pirapaharan and the TNA MPs discussed ways of taking forward the stalled peace talks and negotiating the LTTE’s proposal for Interim Self Governing Authority (ISGA) with the new government in Colombo. 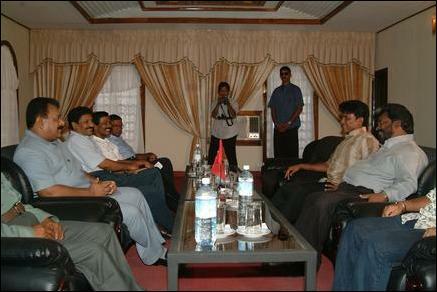 Mr. S. P Thamilchelvan, head of the LTTE’s political division, Mr. Pottu Amman, head of the LTTE’s national intelligence division, Mr. E. Kousalyan, head of the LTTE’s political division in Batticaloa, Col. ‘Bhanu’, commander of the Kittu Mortar Regiment, Col. Thurga and Col. Vithusha (commanders of LTTE’s female fighting regiments), Mr. B. Nadesan, chief of Thamil Eelam Police Service, Mr. S. Thamizhenthi, head of the LTTE’s finance division and the heads of political divisions for the Trincomalee, Vavuniya and Jaffna took part in the meeting. “I seek your forgiveness on behalf of the people of Batticaloa for the calamities that beset our region during the forty-one days when it was held in the grip of Karuna. I urge you declare as martyrs the fighters who were killed on Karuna’s side when the Liberation Tigers retook Baticaloa. 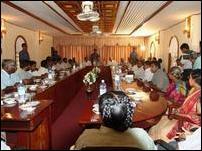 The parents of those fighters sent them to the LTTE to achieve our liberation. Hence I plead with you to declare them as martyrs too”, Mr. Pakkiyaselvam Ariyanethiran asked Mr. Pirapaharan during the meeting. The LTTE leader told the MP elect from Batticaloa that his request would be considered favourably as one coming from a person elected by the people. “We do not believe that we can achieve anything by going to Parliament. We firmly believe that we can realise our aspirations only under your leadership. If our aspirations are frustrated by the southern polity again we would join you in the liberation struggle”, said Mr. Sivanathan Kishore, MP elect for Vanni. 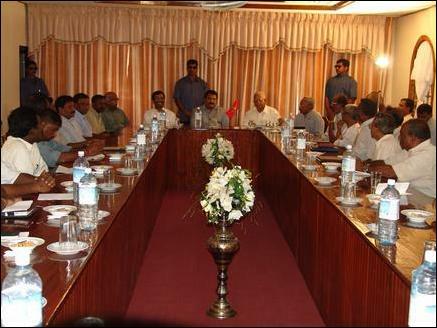 The TNA MPs had lunch with the LTTE leader after the conclusion of the meeting which commenced at 10. 30 a.m. Tuesday. 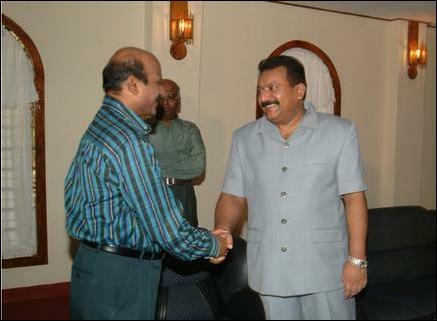 Mr. P. Chandraseharan MP, Leader of Upcountry People's Front (UPF) and Mr. Mano Ganesan MP, Leader of Western Province People's Front (WPPF) also met with the LTTE leader Tuesday in separate meetings.